According to Memorial Sloan-Kettering Cancer Center’s website, “In vitro and animal studies indicate that the leaf, seed, and root extracts of Moringa Oleifera have anticancer, hepatoprotective, hypoglycemic, anti-inflammatory, antibacterial, antifungal, antiviral, and antisickling effects. They may also protect against Alzheimer’s disease, stomach ulcers, help lower cholesterol levels, and promote wound healing.” [ix] All I can say is “WOW!” When mainstream cancer clinics start to tout the benefits of a natural botanical, then we know that there must be something to it! 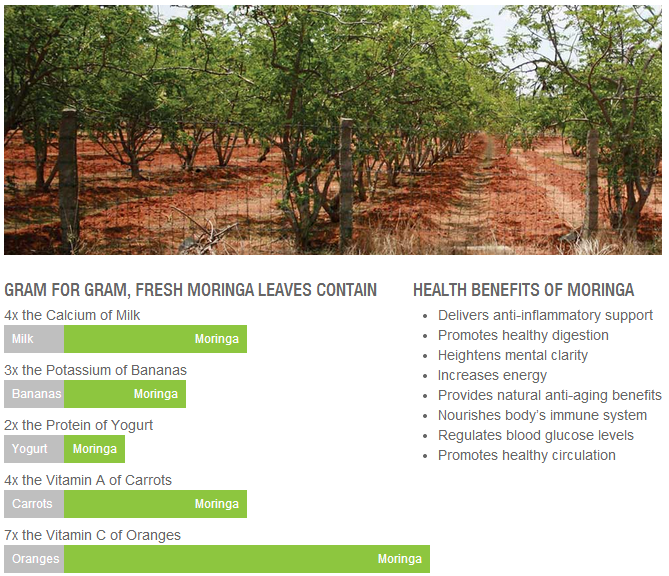 But that’s just the tip of the iceberg with Moringa oleifera! [ii] Fahey J W. Moringa oleifera: a review of the medical evidence for its nutritional, therapeutic, and prophylactic properties. Trees for Life Journal. 2005;1(5) p. 1-13. [iii] Paliwal R, Sharma V, Pracheta V. A review on Horse Radiah Tree (Moringa oleifera): A Multipurpose Tree with High Economic and Commercial Importance. Asian Journal of Biotechnology. 2011;3(4):p.317-328. [iv] Fisher H W. Moringa Oleifera: Magic, Myth or Miracle. Britannia Press. Toronto. 2011. [v] Kumar N A, Pari I. Antioxidant action of Moringa oleifera Lam (drumstick) against antitubercular drug induced lipid peroxidation in rats. J Medicinal Foods. 2003;6(3):p.255-259. [vi] Bharali R, Tabassum J, Azad M R H. Chemomodulatory effect of Moringa oleifera, Lam, on hepatic carcinogen metabolizing enzymes, antioxidant parameters and skin papillomagenesis in mice. Asian Pacific Journal of Cancer Prevention 2003;4:p.131-139. [vii] Njoku O U, Adikwu M U. Investigation on some physico-chemical antioxidant and toxicological properties of Moringa oleifera seed oil. Acta Pharmaceutica Zagreb. 1997;47(4): p.87-290. [viii] Siddhuraju P, Becker K. Antioxidant properties of various solvent extracts of total phenolic constituents from three different agroclimatic origins of drumstick tree (Moringa oleifera Lam.) leaves. Journal of Agricultural and Food Chemistry. 2003;51:p.2144-2155. [xi] Ramachandran C, Peter K V, Gopalakrishnan P K. 1980, Drumstick (Moringa oleifera): A multipurpose Indian Vegetable. Economic Botany, 34 (3) p.276-283. [xii] Kjaer A, Malver O, El-Menshawi B, Reisch J. Isothiocyanates in myrosinase-treated seed extracts of Moringa peregrina. Phytochemistry 1979;18:p.1485-1487. [xiii] Kurup P A, Narasimha Rao P L. Antibiotic principle from Moringa pterygosperma. Part IV. The effect of addition of vitamins and amino acids on the anti-bacterial activity of pterygospermin. Indian J Med Res. 1954;42:p.101-107. [xv] Njoku O U, Adikwu M U. Investigation on some physico-chemical antioxidant and toxicological properties ofMoringa oleifera seed oil. Acta Pharmaceutica Zagreb. 1997;47(4):p.87-290.